The New York–based choreographer Ishmael Houston-Jones has been a leader and educator in the field of contemporary dance for over thirty years. 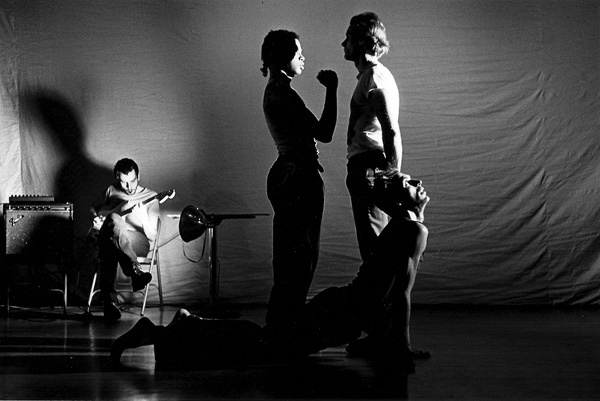 This year, the New Museum and Performance Space 122 are coproducing the twenty-fifth-anniversary version of Them, a controversial work that Houston-Jones made in collaboration with the musician Chris Cochrane and the writer Dennis Cooper. On September 30 and October 3, 7, and 10, audiences can view rehearsals for Them at the New Museum as part of a project called Them and Now. From October 21 to 30, PS 122 will present an updated version of Them. Here Houston-Jones discusses the work’s origins. THE FIRST TIME I heard about Chris Cochrane was also the first time I saw him play, at a club called 8BC in a destroyed building on Eighth Street between avenues B and C. They had liquor there, but it was more of an arty club. I thought his music was incredible. It wasn’t so much punk rock but it was punk-influenced. There was a lot of musicianship. When I first met Dennis Cooper he was reading at some club on the West Side. There was a buzz about him before his arrival in New York; people were really excited. I didn’t know him at all. He’d been publishing Little Caesar out in LA and there was a performance place called Beyond the Baroque out there that he was the leader of. When I heard him read, I was shocked that literature could upset me so much. It was something from Tenderness of the Wolves. And after I said, “Do you want to work with me?” And he said, “Sure,” even though he didn’t know who I was. That was probably 1985, and at the time there was a whole community around PS 122. It was artist-run in those days. I would go to the Kitchen in SoHo, but PS 122 was in my neighborhood and it was sort of a clubhouse. The art and dance worlds then weren’t as geographically spread out, nor were they quite as professionalized. (Dancers today have much greater facility, I’ve noticed.) It was very downtown Manhattan–centric. We never went to Brooklyn. Now the scene is very dispersed. To see edgy or interesting stuff you really have to travel. It’s not terrible. It’s a different mode of relating, and thus a different kind of community today. “Them” comes out of a long tradition of my one-word titles. I think it’s actually the name of a 1950s horror film about giant ants, which has nothing to do with the piece. The first line Dennis reads is, “I saw them once. I don’t know when, or who, they were.” Them evolved over time. There was a short version in 1985 at PS 122, essentially a work in progress. It was Chris, Dennis, myself, dancer Donald Fleming, and the actor Jonathan Walker; and the institution’s director, Mark Russell, asked us if we wanted to expand it. Like many of my dance works, Them is a highly scored improvisation. The movements are not illustrative of any of the other elements: The music, the dance, and the text happen along three parallel tracks. Near the end there’s this looping section where two guys are on a mattress. They push each other up, then push each other down. After that they disappear and a dancer, who used to be me, is brought out by a figure in black and thrown blindfolded onto a mattress and an animal carcass is thrown on top of him and there’s this wrestling scene and then it ends. The mattress and animal carcass were a sort of acknowledgment of AIDS. People were dying—friends, people we knew. There was panic. The carcass on the mattress came from a dream my friend had. In it he woke up and he was lying next to his own dead body; he would try to throw it out of bed, but it kept coming back on top of him. It’s also about my fear of death. I still can’t change a mousetrap. I’m really squeamish around dead things. There was a time when the Meatpacking District used to be an actual meatpacking district. There were buildings filled with animal carcasses. I remember I had my mind set on having a goat, and I went around to all these places and none of them had one. There was this place that had mostly pigs, but there was one goat, really beautiful, with all its fur still on. I couldn’t go back to get it until 4 AM, so I brought one of my dancers with me and we put it in a bag—it looked like a human body. We took it in a cab back to my place on Suffolk Street. At the time the building was really hot and I tied it with an electric cord and hung it out the window overnight. The next day I put it around my shoulders and carried it to PS 122, just in time for the dress rehearsal. We’re not sure where we’re going to get the goat this time around.